The Match Sequence Template allows you to test your Participants’ knowledge of the steps required in a sequence. This makes it perfect for assessing chronological events or physical processes. 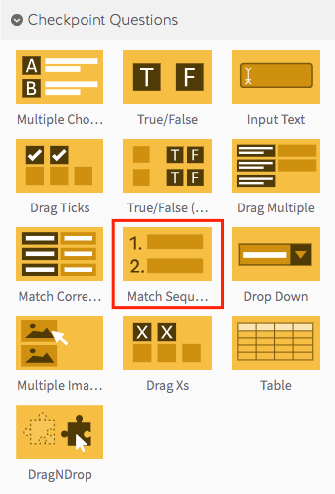 Step 1: Select the Match Sequence Template from the ‘Interactive/Challenge Templates’ panel. Step 2: Drag your Match Sequence Template into the Lesson Pathway. Step 5: From the edit screen, you can choose to change your title. Step 6: To begin editing your template, click the ‘Edit’ button in the Checkpoint question editor. Step 7: Type your question in the Question field. Step 8: Click the 'Add Answer' button to include the first step in your sequence. Step 9: To add more steps in your sequence, repeat Steps 7 and 8. You can re-order each step by using the ‘drag and drop’ handles on the left. The order they’re displayed in here is the correct order of the sequence. Step 10: To preview your challenge template, click on the ‘preview’ icon.